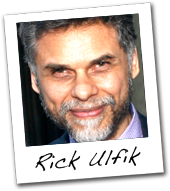 Rick Ulfik is a member of the Evolutionary Leaders Circle, a project of the Source of Synergy Foundation. Rick is the Founder of We, The World and the WE Campaign at WE.net. We, The World is an international coalition-building organization whose Mission is to maximize social change globally - until we have a world that works for all. To fulfill this mission We, The World creates and promotes Programs, Platforms and Campaigns that unite and amplify the efforts of changemakers working for the Common Good. Rick is the Co-Creator of the annual 11 Days of Global Unity - 11 Ways to Change the World September 11th through September 21st, the International Day of Peace. Launched by We, The World and global partners in 2004, 11 Days has become a worldwide platform for the promotion of peace, justice, sustainability and transformation that annually includes as many as 700 associated events in over 60 countries. Supporters and participants include: Desmond Tutu, Jane Goodall, Deepak Chopra, Bill McKibben, Marianne Williamson, Daniel Ellsberg, Amy Goodman, Ralph Nader, Hazel Henderson, Patch Adams, Eve Ensler, Arun Gandhi, Riane Eisler, Robert Thurman, Barbara Marx Hubbard and many others. Rick has worked with Nonviolent Communication (NVC) since 2004 and has been an NVC workshop facilitator with the New York Center for Nonviolent Communication. He has participated in many workshops led by internationally acclaimed mediator and creator of NVC Marshall Rosenberg, who joined the Advisory Board of We, The World. Rick Ulfik is also an award-winning composer and keyboard player who has written, arranged, produced and orchestrated music for ABC TV, NBC, CBS, the Olympics, feature films, commercials, records, and has performed with Queen Latifah, Phoebe Snow, Carlos Santana, Bernadette Peters, and Judy Collins . Rick serves every year as an Emmy Awards Judge for News, Documentaries, and Music. Rick Ulfik is the Founder and Board Chair of We, The World, a non-profit organization that develops global networks of collaboration and organizes large public gatherings to build mass involvement in the work of creating a peaceful, caring, sustainable world. Advisors and supporters include Nobel Peace Laureate Archbishop Desmond Tutu, Dr. Jane Goodall, Dr. Deepak Chopra, Daniel Ellsberg, Dr. Riane Eisler, Robert Thurman, William Schulz (Amnesty International USA Executive Director 1994-2006), Patch Adams, Hazel Henderson, and about 70 others. Rick is Founder and a Principal Organizer of the WE Campaign - www.WE.net This is a global campaign to unite and amplify the efforts of people, organizations and movements working for the common good. Rick is also Principal Organizer of 11 Days of Global Unity Sept. 11-21, an annual promotion of peace, sustainability and transformation that now includes more than 700 associated events in over 60 countries around the world. In 2004 We, The World launched 11 Days of Global Unity as a breakthrough platform for linking local awareness and action campaigns into an inspiring international movement to create>a world that works for all. Supporte>rs of the launch included Nobel Peace Laureate Archbishop Desmond Tutu and 11 Days Honorary Co-Chairs Jane Goodall, Deepak Chopra, Irene Khan (Secretary General of Amnesty International), Marianne Williamson, John McConnell (one of the original Founders of Earth Day), Hazel Henderson, Ervin Laszlo, Jonathan Granoff, Barbara Marx Hubbard, Robert Thurman, Sally Fisher, Riane Eisler, Lynne Twist, Paul Winter, Nina Meyerhof, and New York City Councilman Alan J. Gerson. 11 Days includes concerts, festivals, webcasts and many other activities around the world. By combining artistic presentations, inspiration, consciousness-raising and taking action, 11 Days embodies our strategy of Inspire, Inform and Involve for moving humanity off the path of catastrophe and towards creating a peaceful, sustainable world. Rick co-produced Visual Voices a 13-part TV Series that presents voices in media, politics, culture and the arts who are shaping our world. It was broadcast on the Dish Network, available in over 15 million homes, and is currently running in New York City. He has also written, produced and directed two short films. Rick Ulfik is an award-winning composer, musician, sound design specialist and audio engineer who is well known and respected for his work in television, film, and many other media. During the last 30 years he has been a member of hundreds of television, film, commercial and other media production teams. Composer Underscoring Credits include: The Fire Unleashed (ABC-TV 3-hour Prime Time Special with Peter Jennings), Growing Old in America (ABC-TV 3-hour Prime Time Special with Hugh Downs), Dangerous World: The Kennedy Years (ABC), Another World (NBC), Guiding Light (CBS), All My Children (ABC), The Olympics (NBC), French Tennis Open (NBC), NCAA Basketball (ABC), The Peace Corps (Harry Belafonte), Delta Airlines, VISA, Prudential Insurance, IBM, Estee Lauder, Sea World and many others. Rick has done keyboard work, arranging, sound design and/or musical direction with the following artists: Queen Latifah, Phoebe Snow, Carlos Santana, Spike Lee's film production "New Jersey Drive", Kurtis Blow, Noel Pointer, DJ Mark James The 45 King, Samantha Sang, Sheryl Lee Ralph, Pete Seeger, Ester Satterfield, Judy Collins, Bernadette Peters, Jane Olivor, Rupert Holmes, Maureen Mcgovern, Musique "Keep On Jumpin'", Bernard "Pretty" Purdie, Jimmy Owens, Lester Chambers and many others. Songwriting Credits include: Firesign (Record Label: RCA, Artist: Cory). Rick was the co-writer of 5 of the album's tunes, including the title track (which hit the Billboard and Record World Top 100 Charts). Grammy Award nomination, Clio awards, and the Parents Choice, Kids First, and National Educational Media Network awards for excellence in musical educational materials. Rick has served for many years and continues to serve as a judge for the Emmy Awards. He has also served as a judge for the Clio and NY Festivals awards as well as the United Nations special UNESCO award for excellence and social significance in documentary television. For many years Rick has had a strong interest in being involved with groups that promote peaceful and fulfilling interactions. He was a co-leader and coordinator of the 1993 United Nations event "Celebration For the Children of The World" endorsed by Secretary General Boutros Boutros-Ghali. He was one of several principal organizers of Michael Lerner's historic National Summit On Ethics And Meaning in Washington, D.C. in April of 1996 which was attended by 1,800 people and included David Korten, Corinne McLaughlin, Henry Louis Gates Jr., Marian Wright Edelman, Pete Seeger, Marianne Williamson, Daniel Ellsberg, Cornel West and many others. He also was an organizer for the 1998 United Nations Gandhi/King Season For Nonviolence honoring the 50th and 30th memorial anniversaries of Mahatma Gandhi and Dr. Martin Luther King Jr. endorsed by the Dalai Lama and Kofi Annan with participation by close to 2,000 people including Jesse Jackson, Arun Gandhi, over 500 organizations, and events taking place in 115 cities. As Co-Chair of the National Board of The Foundation for Ethics and Meaning, he was one of three principal organizers of Re-Imagining Politics and Society at the Millennium, a conference in May of 2000 which featured Wei Jingsheng, Cornel West, Michael Lerner, David Korten, Naomi Klein, Arianna Huffington, Mark Green, Patricia Ireland, Cora Weiss, Marianne Williamson, and over 200 other speakers from around the world. Rick was the principal organizer of We, The World's Videoconference Series Building Peace and Security in the 21st Century started in 2003 which connects schools with the United Nations and featured speakers from around the world. Interacting with inspiring speakers like Dr. Jane Goodall and Congressman and Presidential Candidate Dennis Kucinich, students and others are supported and encouraged to create a dream and vision of peace, and then put their dream into action. The videoconferences each involved hundreds of students, faculty and others (close to 1,000 total). Students and faculty interacted with speakers and came away informed, inspired and motivated to participate in many different kinds of peace activities. Education Update (a newspaper that reaches 200,000 parents, educators, and students) has made our Sept. videoconference the Cover Story of their 8th Anniversary issue! Utne Magazine website ran a feature story at the start of the series entitled "All About Solutions". After college, Rick was a math teacher, math tutor, and music teacher in the New York City Public School System. He has served as a High School Executive Internship Sponsor.